During our Dominican Republic vacation, we stayed in Juan Dolio for a couple of days. While we were in Juan Dolio, we explored the beach, went to Cuevas de las Maravillas, and took a half-day trip to the Colonial Zone in Santo Domingo. The colonial zone is pretty small and we only needed a couple of hours to explore it. Obviously you could spend more time there if you go into every museum and take more breaks to sip an ice cold passion fruit juice at a cafe in parque Colon. 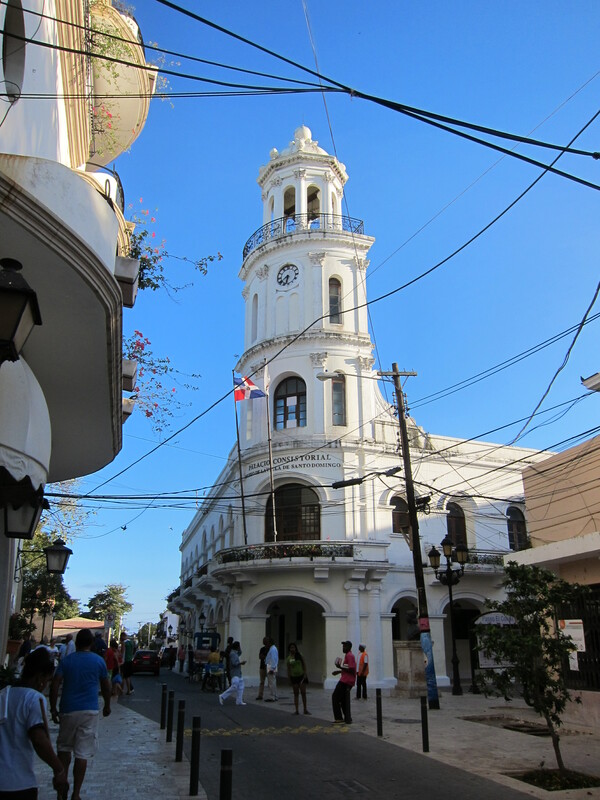 There are a ton of little museums and the admission to each one is around 50-100 Dominican pesos, or around $1-2. That is such a nice change from being a tourist in Europe, where a museum would set you back $15-20 and several hours, so you REALLY need to decide if you want to go in and spend precious tourist energy (think of your tired feet!) and money. Obviously, the quality of museums is a little different, but the museums in the colonial zone were just as interesting to me. Classical art is great, but I enjoy more learning about how people lived, seeing furniture and castles from back in the day, and imagining what life was like back then. 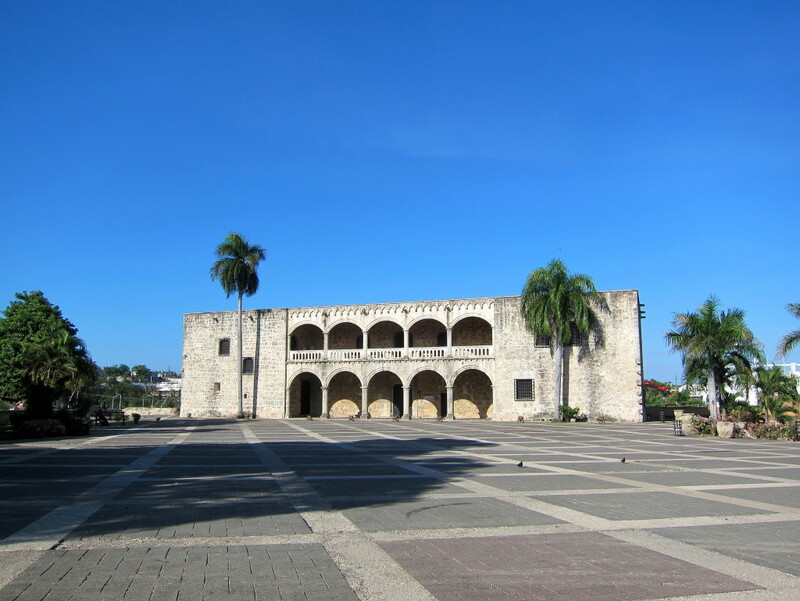 After we explored most of the streets in the colonial zone, we decided on a couple of museums – the Amber World museum, Alcazar de Colon, and Fortaleza Ozama. 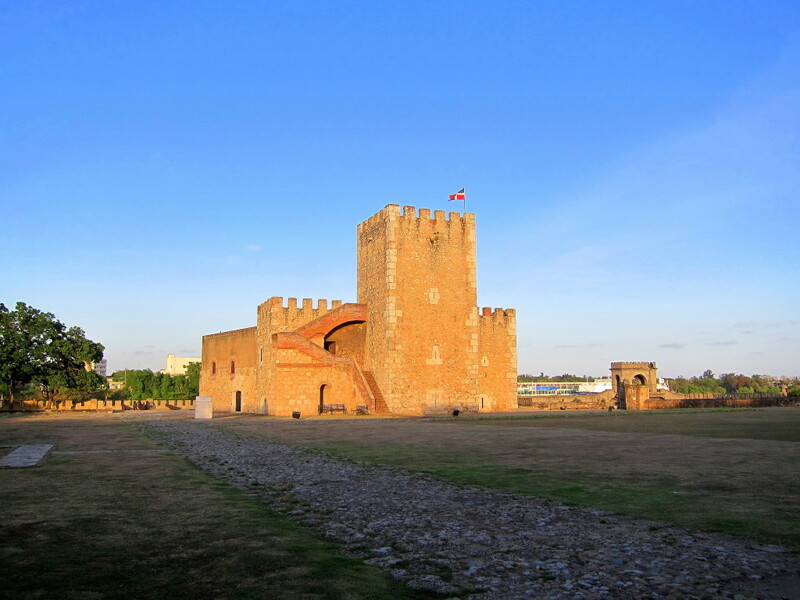 The funny thing about Fortaleza Ozama is that the first time we walked by it, they tried to lure us into the fortress, but Aldo told them we needed to go find water or some cold drinks before we went in. So the guards offered to get someone to fetch us the drinks from the nearest store/cafe and we could just go in and wait for them. People are willing to do anything for an extra buck in the Dominican Republic. We declined their offer because not only did I want a drink, but also to sit down for a little while in the shade. When we came back to the fortress a few hours later, it was already closed (things close at 5pm in DR, so plan ahead!!). But then I heard some quiet mumbling in Spanish between Aldo and the guards, and all of a sudden we were in the fortress with a personal guide. Turns out that for a few extra dollars they offered to let us in even though it was closed – some of the money would go to the guards to stay at their post for a little bit longer, and some would go to the guide. Win-win for everyone, I guess! The Amber World museum was pretty cool. 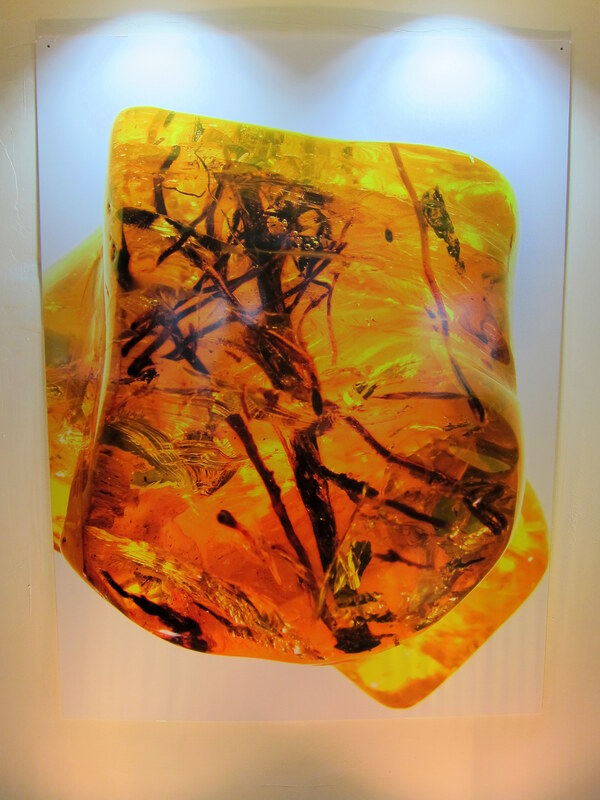 I am embarrassed to admit it, but I didn’t know that amber is fossilized tree resin – I thought it was a gem of some sort! So in the museum they had lots of pieces of amber that fossilized with bugs and leaves in them, and some of them are really pretty! A lot of the amber pieces also had their pictures blown up with a microscope and printed out, so you could really see the details in the ancient bugs and leaves. Obviously, the amber that is valuable are the flawless pieces without any bugs or leaves trapped in them, but I really liked seeing the imperfect amber. 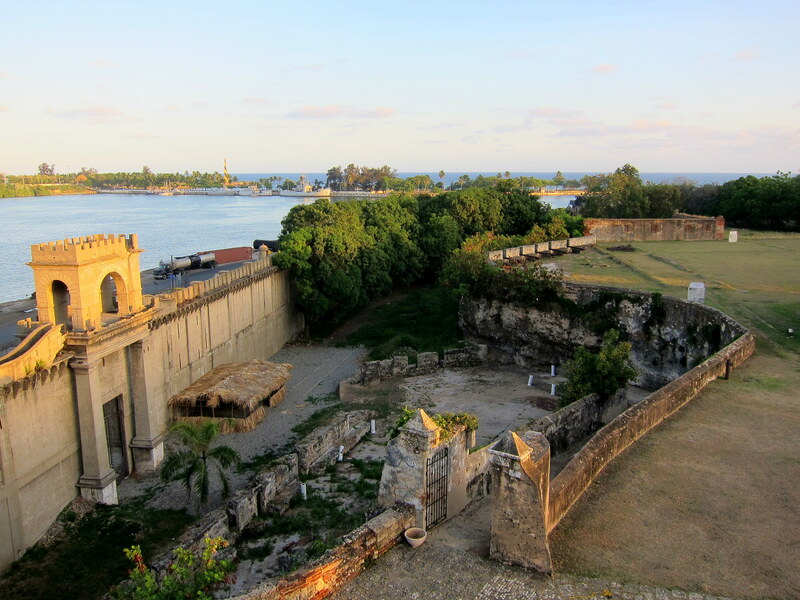 Alcazar de Colon was a house built in the early 1500’s by Diego Colon, the son of Christopher Columbus. 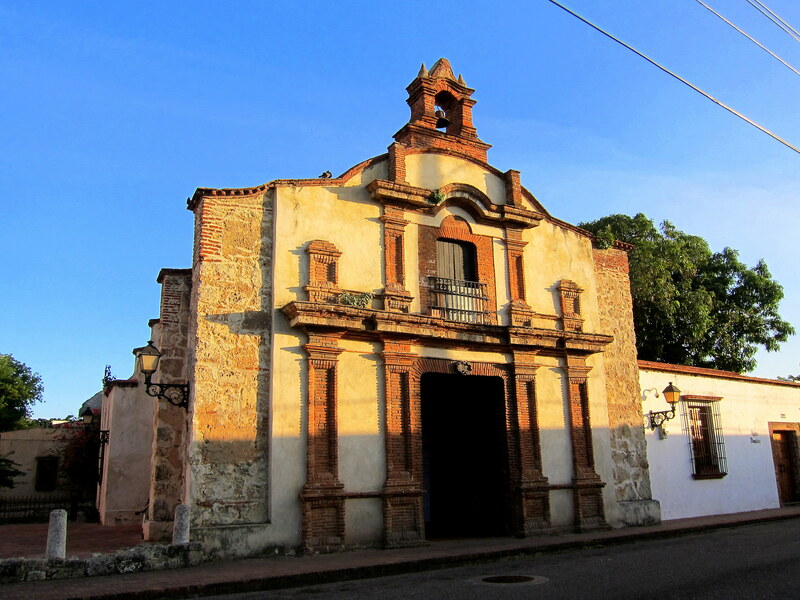 During the early colonial times, many expeditions were planned in this house. In 1586 the house was taken over by Sir Francis Drake, and by the mid-1700’s the house was abandoned. That’s kind of crazy to think about because it is a huge mansion – why wouldn’t anyone want to move in there, clean it up, restore it, and claim it as their home?? The museum itself had old furniture, tapestries, art, and my favorite part – the kitchen! 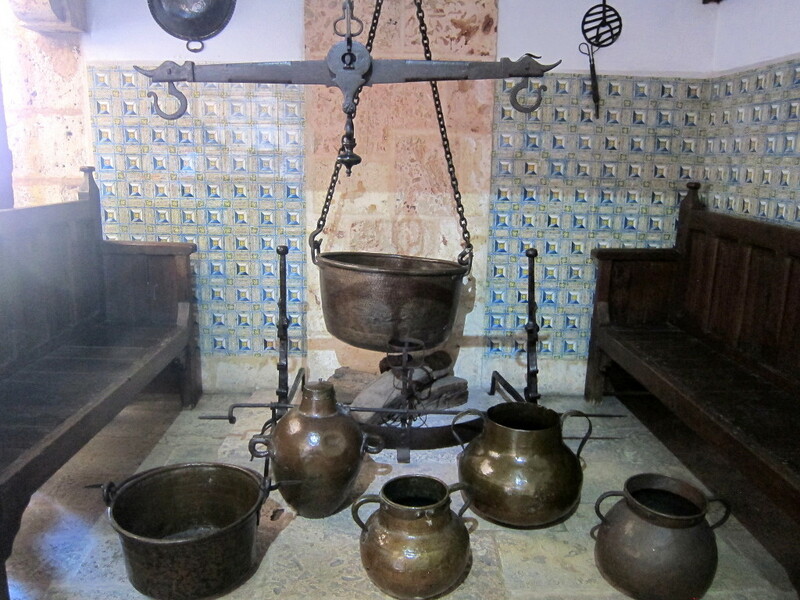 I love looking at old kitchen set-ups and cooking ware. We had a great time exploring the colonial zone in Santo Domingo. 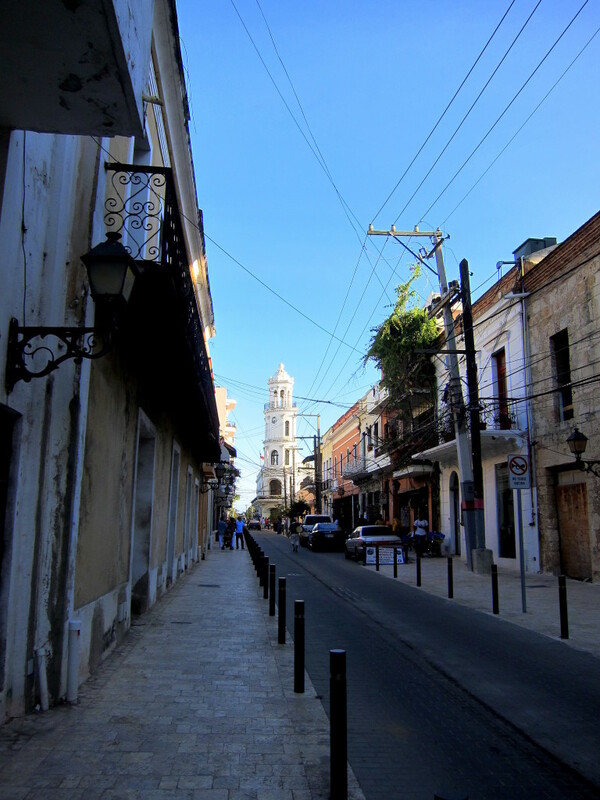 It reminded me a bit of Old San Juan in Puerto Rico, just… not quite as nice. It was encouraging to see that a lot of work was being done to fix up the colonial zone – fixing roads, widening sidewalks for pedestrians, manicuring the parks to keep them nice. I am hoping that in a couple of years the area becomes even nicer than it is now due to all the work being done on it. After the colonial zone adventures, we went to Adrian Tropical to meet Aldo’s friends and cousin for dinner. We had mofongo there, and as we were eating his friends mentioned another Mofongo place we HAD to try… a side-of-the-road restaurant called Mi Terraza in Moca. Luckily Moca was just a slight detour from the road we were taking to get back to Santigago, so we made a plan to stop there. And let me tell you, it was the BEST thing we ate in the Dominican Republic. We ordered one order of mofongo with chicharron and cheese on top, and it was more than enough for us – we both ate and still took some to go. It was just so delicious, with crunchy pieces of chicharron all throughout the mofongo. Oh my goodness. No fancy mofongo place would EVER be able to make something that good!